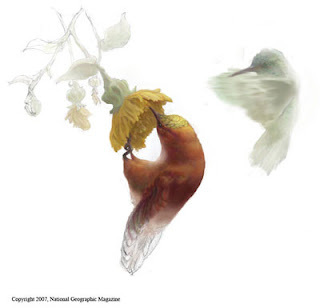 I never posted this up on this blog, but I thought I'd share a piece that I illustrated for the National Geographic Magazine for an article about the endangered Juan Fernandez Firecrown Hummingbird. It appeared in the September 2007 issue...better late than never. Hope you enjoy! Images in this post are copyright of National Geographic Magazine.